This is the first vinyl LP release from the Acrobat label, and it features, appropriately, a recording from the vinyl era which has long been unavailable since its 1986 LP release. 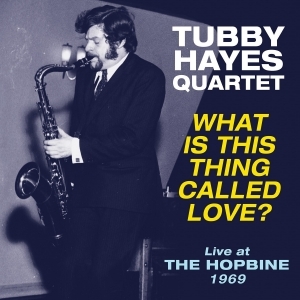 It is a ‘live’ recording from 1969 by one of the greatest of all British jazzmen, tenor saxophonist Tubby Hayes, performing at one of London’s most popular jazz venues, the Hopbine pub in Wembley, where Tubby’s fellow tenor player Tommy Whittle used to run a weekly jazz night. He was playing there with his regular quartet comprising Mike Pyne (piano); Ron Mathewson (bass); Spike Wells (drums), and the LP features two extended pieces, one on each side of the LP. After hitting a career low point in 1968 as a result of his heroin addiction, he was rebuilding his health and career and had thrown himself into a punishing round of ‘live’ work and recording, and was looking for new musical challenges, as the music landscape was evolving rapidly around him, and contemporary musicians were pushing boundaries of their own with psychedelia and progressive rock. He was still in vibrant form and still a master of the kind of hard bop tear-up exhibited in parts of these performances, and still able top find a new way of approaching a standard like “What Is This Thing Called Love?”, as well as introduce his own compositions like “For Members Only”. However, this was one of the final performances of this kind by the quartet, as it was only a month later that he collapsed was hospitalised – the beginning of the health issues which would bring about his demise in 1973. As such it is an important musical landmark, as he saw out the ‘60s in typical style.